My Catholic school education across three schools in Bedford always involved a bus journey, and starting upper school in September 1985 took the bus journey right across town (and seemingly through most of its streets) into uncharted territory to me, far north of the river. The bus stop specified on my free bus-pass was ten minutes’ walk away, but over time us paupers from the south of the river realised that the drivers were happy with a flash of the card and probably wouldn’t notice if we started going rogue and getting off the bus in the town centre and changing to a more direct one that stopped right near my house. And for the most part, it worked, though there was the double-jeopardy of the mythical inspector getting on which provided an ever constant fear! Then there was the additional thrill of sprinting across town from one bus to the next to not miss the first one home (otherwise there was little point in the whole exercise). But as we became more experienced in being teenagers, that sprint became a leisurely stroll via our favourite shops, namely WHSmith to see if the new Computer & Video Games or Smash Hits was out, a newsagent that was the first to stock Cherry Coke, and a tiny independent games shop in the newly opened Boulevards shopping arcade that had the biggest VIC-20 section I’d ever seen! Which in a very roundabout way brings me to the point that at this time, a lot of what you bought was solely down to judging a book / record / game (I don’t think anything else to buy existed then) by its cover. On one of these trips, on a Friday afternoon towards the end of the VIC-20’s life when magazine coverage had all but dried up, I was completely seduced by a cops and robbers game that I can’t for the life of me remember the name of, but had some huge, impressive sprites on the back of its box that I just couldn’t resist but had no money to buy. And I’ve a horrible feeling it was full price… The following morning, with funds in place, I convinced my Dad to drive me into town, then drive around while I ran in to the shop and bought it. I’m not sure if I feel worse today for making him do that or wasting what was probably several weeks of pocket money on that button-mashing turd – you played the big on-screen robber on the run from the big on-screen cop and just waggled the joystick left and right as fast as you could until your hands hurt too much and he caught you. Game over. But sometimes judging a game by its cover worked out fine, and there’s no greater example of this than Joe Blade. I don’t think there was a lot of life left in my favourite games shop (or the too-exotic-for-Bedford Boulevards shopping arcade) when 1987 came, but once again seeing those screenshots – on a budget title no less – meant must-buy. 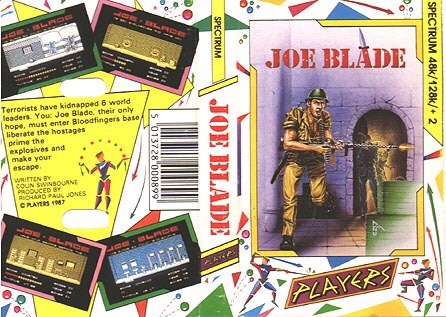 Joe Blade was monochrome Spectrum graphics in all their colour clash-free glory – big, detailed black sprites and environments on garish yellow, purple, green, turquoise, etc. backgrounds that made complete sense providing you didn’t think about them too much! And the sprites were so big and detailed that you could easily have mistake the distinctly moustachioed Joe for Charles Bronson hoofing Germans all about the place, even at cassette box size! Actually, they turned out not to be Germans but the minions of the evil mastermind Crax Bloodfinger, who’s kidnapped a load of world leaders that you need to rescue. But they did look enough like German soldiers to give it the distinction of being one of the first games banned there! Once you’re in his lair, you run about the flip-screen complex shooting up the non-SS goons, collecting stuff like ammo, keys to open cell doors, food and booze for health, disguises that give you temporary immunity and bombs that you need to prime in a letter-rearranging mini-game. Once you’ve sorted all the bombs and come across the six hostages, it’s time to escape from where you began. The gameplay was a lot like Dan Dare (see my post on that HERE) though probably a bit less frantic in terms of gunplay (especially as you didn’t get shot by the armed enemy but lost health on contact), but those cell keys were not easy to come by and that complex was complex, so a bit of mapping on some graph paper you’d nicked from your classroom stationary cupboard was essential! Whilst the box screenshots did do some justice to the wonderfully evocative (not World War 2) scenery and humorous touches such as the goon-like prisoners and sleeping hostages slumped on the floor with their arms casually behind their heads, what they couldn’t do justice to was the superbly smooth animation, and on my +2 at least you also had the benefit of some decent sound from the 128K version. I don’t think I ever defused all the bombs or rescued all six world leaders, or even completed my map, but as was often the case with games at the time, it wasn’t about reaching the destination, but having a total blast over and over again without caring if you ever got there. Joe Blade is up there with the best of the original budget games ever released (the untouchable Feud excluded of course), and was more stylish and playable than most full priced games at the time.